Proxy42, a gaming and hardware company specializing in augmented reality (AR), has launched its pre-sale for Father.IO and the “363R” Trigger. This combination is the first MMO and “mobile wearable” for an ARG blended with real world environments. 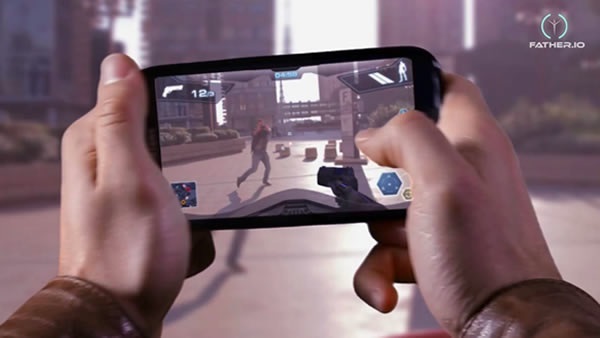 Players can download the free Father.IO mobile app, attach the Trigger to their smartphones, and then interact with the real world through a camera-style interface with an FPS overlay. Players can then use their phone as their laser, and their camera as a field of view, to blast enemies many yards away with precision. The game is Risk-like, transforming cities into a science fiction reality. Players can also complete location-based quests and capture territories. While the strategy component of the game remains free, players must purchase the trigger, currently pre-priced at $59, to enter the first person shooter mode. The idea is to make an FPS that is not only a social activity, but one that becomes a physical and interactive activity. The game plans on entering beta in Spring 2015. You can find out more about Father.IO at its website. New content is coming early to Guardians of Ember today, with the beta release of Act 6. Ten new desert landscapes await players.